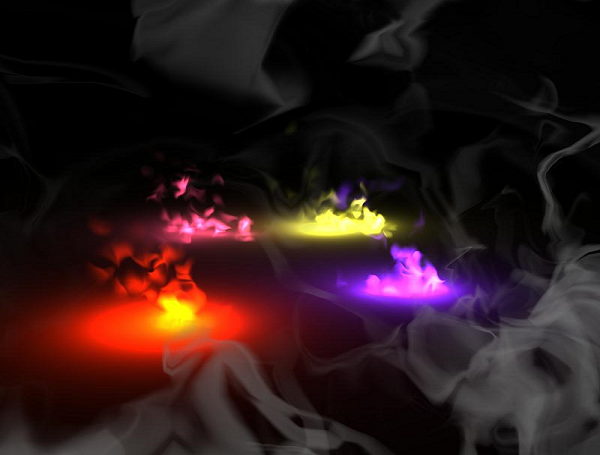 Developing a visually convincing model of fire, smoke, and other gaseous phenomenais among the most difficult and attractive problems in computer graphics. We have created new methods of animating a wide range of gaseous phenomena, including the particularly subtle problem of modelling “wispy” smoke and steam, using far fewer primitives than before. One significant innovation is the reformulation and solution of the advection-diffusion equation for densities composed of “warped blobs”. These blobs more accurately model the distortions that gases undergo when advected by wind fields. We also introduce a simple model for the flame of a fire and its spread. Lastly, we present an efficient formulation and implementation of global illumination in the presence of gases and fire. Our models are specifically designed to permit a significant degree of user control over the evolution of gaseous phenomena.